Reports should not exceed a one-month time frame. If you need orders for a longer period, split them into 1-month report requests. Go to Settings > Company > Toolbox > Amazon settings > Reports. Click Request New Report at the top of the list. Set the Report Type to FBA Fulfilled Shipments Report. Choose the desired date range. Go to Orders > Import Orders. In the Channel field, choose FBA. Select your saved report file. Click Process Order. A queued import job is created to track the progress of the import and note any errors. 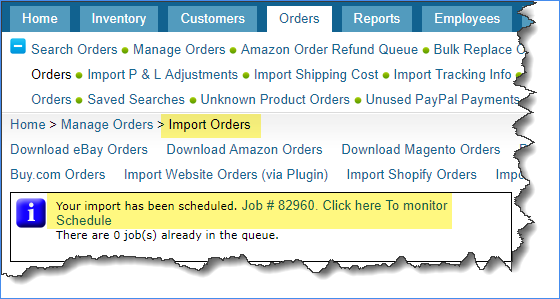 When this queued import job is done, the data will be imported; however, the actual creation of all orders may take several hours, based on the number of orders that were imported.